This past Saturday, Rockhaven Homes received 5 awards at the 38th Annual OBIE Awards Gala. Both The Atlanta Sales and Marketing Council and the Greater Atlanta Home Builders Association host the event each year. 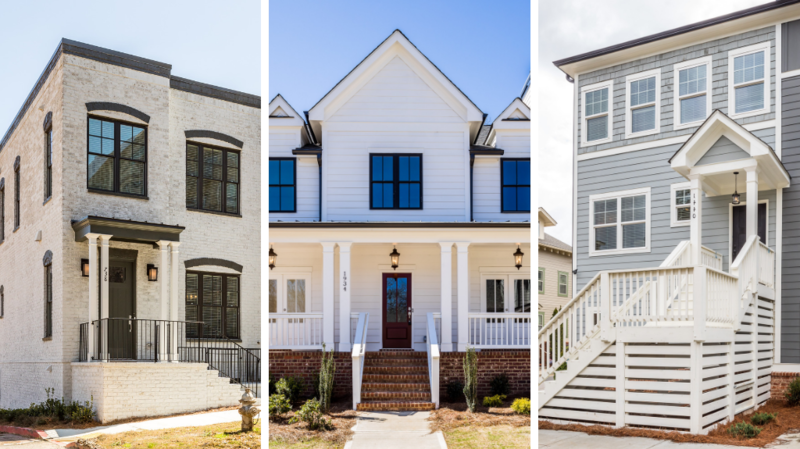 These prestigious OBIE awards recognize home builders throughout intown and metro Atlanta. Among them are achievements in the building and marketing of new construction and remodeled homes. In addition to a Silver OBIE for Best Logo – Corporate Builder/Developer, our team walked away with 5 other awards for the night during the 2018 OBIE Awards. Take a look at our multiple award-winning communities. The model home in Cosmopolitan boasts stylish features that compliment its intown address. You will see the sought after finishes of our award-winning model home throughout the brownstone townhomes in Cosmopolitan. Among these are quartz countertops, cozy fireplaces, double vanities, and much more. Located in Lindbergh Park, this neighborhood also puts you within minutes of shopping, the arts, and local parks. Another one of our award-communities is Eastland Gates in East Atlanta. Here you will find a beautiful selection of 3-story townhomes. Like the home above, each of these townhomes has a spacious open-concept floor plan on the main floor. These homes also feature gorgeous hardwood floors and modern finishes throughout these homes. Additionally, your address in Eastland Gates gives you convenient access to a variety of East Atlanta attractions. Our third community that received recognition at the 2018 OBIE Awards is Park Chase. Located in Brookhaven, this community of stylish single-family homes is minutes from the vibrant lifestyle of Buckhead. The homes available in Park Chase offer charming 4 and 5 bedroom floor plans. Similarly, they each feature stylish front porches and stunning interior features. These include gourmet kitchens, oversized master suites, and spa-inspired master baths. If you’ve been looking for a new home in intown Atlanta, now is the time to come home to one of our award-winning communities. Whether you prefer an address in Brookhaven, Buckhead, or East Atlanta, we have a new home for you. Additionally, we also have stunning new home communities in Sandy Springs and Lithonia. Contact us today to begin your journey towards a life of luxury in a new Rockhaven Home.